The Point neighborhood (also known as the Old Point) is home to some of Beaufort's largest, oldest, and most expensive homes. Defined as the land between Carteret Street and the Beaufort River, this portion of downtown does not follow the major street grid and was once an area where a timber mill operated. Homes in this area range from the impressive mansions that overlook the Beaufort river to Victorian and Queen Anne style homes along Craven Street. Streetscapes are typically dominated by an impressive live oak canopy, often accompanied with Spanish moss. Beaufort is a city in and the county seat of Beaufort County, South Carolina, USA. Chartered in 1711, it is the second-oldest city in South Carolina, behind Charleston. The city's population was 12,361 in the 2010 census. It is located in the Hilton Head Island-Beaufort Micropolitan Area. Beaufort is located on Port Royal Island, in the heart of the Sea Islands and Lowcountry. The city is renowned for its scenic location and for maintaining a historic character by preservation of its antebellum architecture. The city is also known for its military establishments, being located in close proximity to Parris Island and a U.S. Naval Hospital, in addition to being home of the Marine Corps Air Station Beaufort. The city has been featured in the New York Times, and named "Best Small Southern Town" by Southern Living, a "Top 25 Small City Arts Destination" by American Style, and a "Top 50 Adventure Town" by National Geographic Adventure. 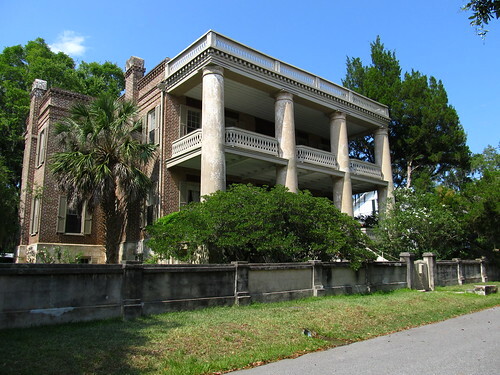 Beaufort Historic District is a historic district in Beaufort, South Carolina. It was listed on the National Register of Historic Places in 1969, and further was declared a National Historic Landmark in 1973. The historic district is renowned for its impressive collection of antebellum architecture that reflect the Federal, neoclassical, and Greek revival styles that were popular during the interwar period, along with the widespread use of tabby. A variety of homes, gardens, commercial buildings, houses of worship and graveyards are featured in the district, with some sites open for public inspection. Continuous efforts at rehabilitation and conservation underline the community's commitment to maintaining the historic nature of the district, which has attracted much acclaim and popularity from visitors and media outlets.